Of the many many reasons I have to be thankful, one of them is this blog and the enormously thoughtful, intelligent readers who drop by to read and comment. I truly am grateful. Thank you. I wish you all happy Thanksgiving (and hope that you have tons of fun in the kitchen today)! 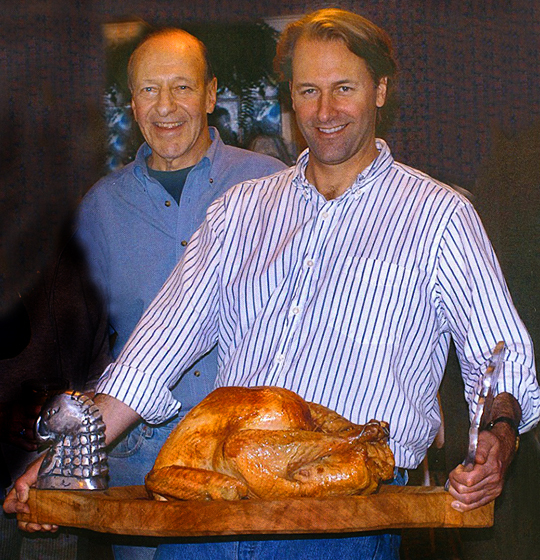 The above photo was taken on Thanksgiving 2007 (I’m struggling to hold the turkey up, but I think it’s important to parade the bird before carving it—my mom found the platter in Mexico). That’s my dad, Rip, with me. It would be the last Thanksgiving I would have with him. Three weeks after this day, he sat me and Donna down in front of the fire after dinner at his house. He had something to say. Recent X-rays showed a spot on his lung, he said. He’d need to go in for a biopsy. A former but long-time smoker, he feared the worst. Which is what it turned out to be. In less than 9 months, he would be gone. Gone, gone, gone. My father was the ultimate giver, the provider of the feast literally and spiritually. So my Thanksgiving message to you, cherished readers, is to be thankful for those you have in your midst, be thankful for what we have this moment, and each moment we have it. Let the people you love know it, let them know it as often as possible. One of the qualities that defined my father was his determination not to be wasteful. He valued economy and efficiency. So it’s appropriate here to remind all of you who will have the carcass of a devoured turkey on hand, to make stock from it. It makes the most wonderful broth. Please don’t discard it. Break it up, put it in a big pot, cover it with water, and put it in a low oven overnight. Doug Katz, the chef who suggested the roast/braise method to me that works so well, would recommend making a barley soup from the stock. Great idea. Sweat some onions or leeks and carrots, add the stock and an appropriate amount of barely, along with any left over turkey you might have on hand! It can be as simple as that. Put all the turkey bones in a pot. The more meat left on them the more flavor your stock will have. You may want to break them apart so that they fit more efficiently in the pot. Cover them with an inch or two of water. Put the pot in the oven and turn the oven to below 200 degrees F. (180 degrees F. is best). Leave them in the oven, uncovered, for at least 8 hours and as many as 16. If you have an enormous pot of water and bones, you may want to bring it to a simmer, and then put it in the oven. Remove the stock from the oven and add the remaining ingredients. Bring the stock to a simmer on the stove top, then turn the burner to low and cook for an hour on the stove top, or return the pot to the oven for a few more hours. Strain the stock through a fine mesh strainer or once through any kind of strainer, then again through kitchen cloth (or one of our all-strain reusable cloths!). Chill, remove the fat from the top. Freeze in pint deli cups. Or make onion and barely soup! My post on making eggs benedict from scratch. Martha Stewart has some Thanksgiving leftovers ideas. Thanksgiving How To Guide by Stay at Stove Dad. I’ll say an extra prayer for your Dad, because you reminded me. The apple never fell from the tree in this case, it’s still growing. What is the appropriate ratio between stock and barley/rice/quinoa/etc? Happy Thanksgiving! I hope you and your family will have a good day today. So very sorry about your dad. That picture is so lovely it bought an immediate tear to my eye. Thanks for how much you’ve influenced my cooking. I made sourdough bagels yesterday for breakfast this morning with the starter recipe and bagel recipes from this site. I just left a comment on the roast-braise post, letting you know just how good it was. The turkey carcass is in a big covered roaster in the oven already. The cycle has begun again. I saved to canned quarts of stock from last years (my first stock making experience, thanks to your post last year), that stock served as my braising liquid this year, and helped create the most wonderful gravy. Your fathers spirit lives on in you Michael. It shows in your writing. The dishes are now cleared, and I’m heading back to the table to be with my family, to share in the love of the moment. If there is one person who in a life who loves us unconditionally, it is a parent. No matter how old we are nor how many kids we have – they are still the only ones in our lives who will love us no matter what. “People” say time heals and I disagree. Time makes the longing and the wishing worse, especially as we age and see our kids growing up. Happy Thanksgiving to all. Make sure there are lots of laughs and lots of jokes. Michael, I’ll tell you what people tell me: you look like your dad! It is great you have this picture. This time last year, my sister and I were cooking both Thanksgiving and Christmas dinners at my mom’s, not really admitting it would be the last time at that table, but now she is in a nursing home and the photo from last Christmas is the last one of her with us at home. It is amazing how many of my mental images of family members are from those holiday dinners, or around the big table on the screened back porch at Grandma Toye May’s house on hot summer evenings when it was just too hot to eat indoors and air conditioning was not even to be dreamt of! I sign off on all my phone calls to family with “I love you” now. The chances and days are gone too soon. Great photo! Because I love and miss my Dad too, your blog brought a tear to my eye. Like you, I am thankful for all the good years. You pay such great tributes to your Dad! And I like the recipe as well! What a truly wonderful and poignant picture, and a thought-provoking post also. You both look so happy and proud in the photo with that magnificent bird! Truly a memory to cherish and be thankful for. Every year I cherish these moments more and more with my dad, thanks for sharing your home/life stories with us. I made the roast/braise turkey, and the stock/gravy recipes you recently posted, and all my guests (17) loved it. Thanks. I emailed you about gizzards in October, and I used some for the gravy too as you suggested. I also emailed your friend Chris Cosentino, and he suggested to confit the gizzards in duck fat. Which I did as well (had 2 turkeys, smoked the other) and use it on a salad with vinagrette, great too. Thanks for the postings, recipes and stories, looking forward to more of your culinary findings. thanks everyone for your warm thoughtful comments. Michael, what a beautiful picture of you and your Dad! I remember him well, especially seeing him on your Hampshire porch babysitting his tiny grandchildren. Thanks for posting this – a tribute to our parents. Thanks for this item Michael, that is a nice shot of you and your dad at a special time. I have had good luck making stocks in a slow cooker, although my little cooker would require several batches to process a turkey. Every time I cut up a chicken I save the leftover pieces for stock. The only downside is that they benefit from a little time on the stove top afterward if you want a more concentrated stock. My dad has been gone for many, many years but I’m grateful for my husband, children and kitty every day. We’ve had some rough times lately so being efficient in all things cooking is important. Not only did I make stock from the carcass (in several parts for different meals) but scraped the bones to make an amazing Turkey Chili, some spicy Gumbo and today for brunch we had the loveliest flaky biscuits with Sausage & Sage Gravy that were truly comforting. Still have some meat for sandwiches with a little dressing and will use the mashed potatoes for croquettes too! Not a thing will be wasted and most will do double or triple duty. I am grateful to know how to cook, it’s not only a useful skill but a blessing you can use each and every day to warm the heart and soul. Have a wonderful holiday season…. Thank you Mr. Ruhlman for posting Oven Turkey Stock Method for the third year running. As for Rip, I remember when he left us and it never goes away; especially when one looks at Rip’s handsome face in the mirror each morning. Honoring his memory and how he lived and what he meant etc. helps quite a bit. I’ve had great success with this turkey stock method. A few questions… Why does turkey stock get all gelatinous when it’s cold? Is it because of the cartilage in the carcass? And, why doesn’t my chicken stock get gelatinous like turkey stock does?